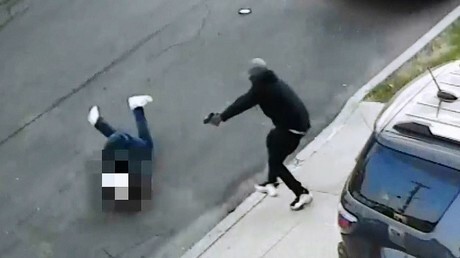 An associate of a New York City crime family has narrowly escaped death after being chased and shot several times by a would-be assassin on the streets of the Bronx, video footage released by police has revealed. Salvatore ‘Sally Daz’ Zottola, a partner in crime of the Bonanno family, which has ruled the streets of New York for over a century, was targeted by an unknown shooter at about 6.30am on Wednesday morning. The newly-released video of the incident shows a red Nissan pulling up next to Zottola’s car. The gunman first tries to take out the 41-year-old through the passenger window, apparently missing his target. The victim then jumps out of his minivan, seeking cover as the hitman continues shooting at the mafia man. Zottola is then seen rolling away, apparently trying to dodge the bullets. With the target still breathing, the assassin gets out of the vehicle to shoot Zottola at point-blank range as the 41-year-old keeps swirling away. After shooting his victim several times, the hitman runs back to the getaway car before speeding away. Zottola was rushed to the hospital in serious condition with wounds to his chest and right hand but is expected to survive. The would-be assassin, meanwhile, remains on the loose.